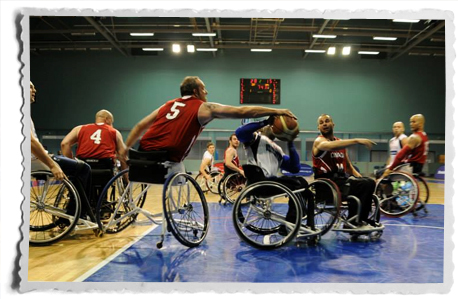 Team Canada held its own at the 2013 Continental Clash, rounding out the final day of play with two narrow losses of 60-58 to Spain and 77-72 to Great Britain. Canada finished the tournament with two wins and four losses, playing only six games to the other teams’ eight. The final match of the tournament saw Canada face off against host nation Great Britain in a packed arena of more than 1000 spectators. Great Britain dominated early on, finishing the half with a 20-point lead of 47-27. Canada fought back in the second half, outshooting Great Britain 28-10 in the final quarter and closing the gap to five points at the final buzzer. The tournament gave the men’s national team the chance to return to international competition for the first time since the 2012 London Paralympics where Canada clinched gold. According to head coach Jerry Tonello, Canada is building towards their next Paralympics gold medal. “I am measuring our success here more on achieving our process goals than by win totals. We have won and lost a few games by close scores. The experience has been invaluable. A gold medal is not won in the first year of a quadrennial. The program goal is to build a solid base of progressive physical and skill development that will result in world class performances four years from now in Rio 2016,” said Tonello. The Continental Clash also gave Canada a chance to gear up for the Americas Zone Championship in August, which is the qualifier for the next World Championship in 2014. For the European teams, this tournament was a last tune-up before the European Championship at the end of June, which acts as the Euro-teams’ qualifier for the World Championship. Germany posted the most wins of the European teams, clinching five wins and three losses. Great Britain and Spain both went 4-4.